A rare, fully customized reverb like no other — back after 30 years. The unique and lush reverb programs of the RMX16 are instantly recognizable, from U2 and Peter Gabriel to Radiohead and Rihanna. Exclusively for UAD hardware and Apollo interfaces, the new AMS RMX16 Expanded Digital Reverb plug-in not only captures the sonics of the original hardware, it adds nine rare, custom programs, giving you double the sonic possibilities of the original AMS RMX16 plug-in. In developing the UAD plug-in version of this landmark processor, Mark Crabtree of AMS Neve dusted off his original schematics and extensive notes. It was a laborious two-year process, but well worth the effort. The end result is a UAD plug-in that contains exact instruction-for-instruction models of the original algorithms — giving you iconic reverb sounds in your DAW. 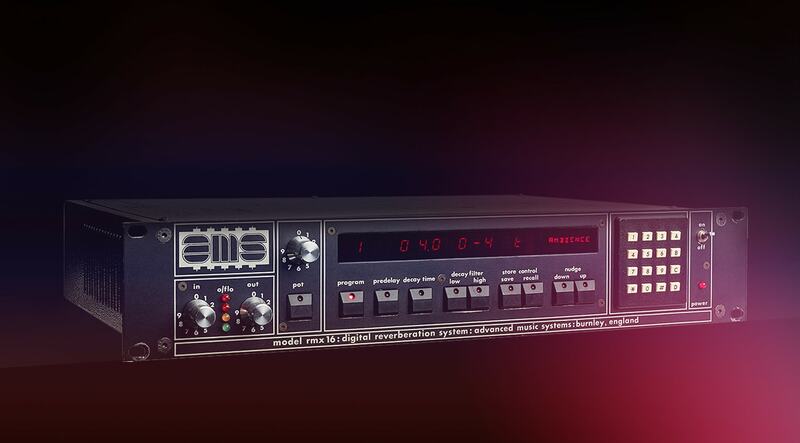 In the ’80s, if you were fortunate enough to have AMS Neve's exclusive aftermarket bar code reader system, you could load nine additional programs into a stock RMX16, including 810 ms of delay, brighter rooms, and variations of the legendary RMX16 Nonlin, Reverse and Plate reverbs. The new AMS RMX16 Expanded Digital Reverb plug-in gives you all of these ultra-rare programs of a fully customized unit. Designed to be musical rather than mathematical (Peter Gabriel owned a prototype unit and delivered notes), the original RMX16 was tuned and re-tuned by ear to provide as wide a "sweet-spot" of settings as possible. The RMX16 Expanded Digital Reverb plug-in faithfully emulates the original’s straightforward control set — meaning no menus to navigate. Whether you’re putting the finishes touches on a lead vocal, transforming a drum bus, or using an Apollo interface to track guitar with shoegaze ambience, the RMX16 Expanded Digital Reverb plug-in marks a powerful update to this unmatched studio tool. Now I understand what the fuss was all about! I can feel it coming in the air tonight, oh Lord, And I've been waiting for this moment for all my life, Oh Lord!!! This reverb sounds great, is super versatile and just has "that" musical sound and character. I love to use this thing on drum machines from the era in particular and I've found great uses for the Echo and Plate algos in addition to the famed Ambience and Nonlin algos. I agree that it needs a touch of EQ to darken it up a little but aside from that it's a thing of beauty and saved me over $2000 that I was about to spend on a hardware unit! This reverb sounds absolutely fantastic ! Although most people only ever swear by its "ambience" and "non-linear" modes, History of music provides us with multiples instances of how all of the other modes were put to a good use (and particularly with the new trends for 80's music revivalism - think Ariel Pink, John Maus & Washed-Out). One of my favorite mode : the Plate mode, which has a very distinct and colorful feeling, and a very musical ringing if you play around with the decay time. All in all : this reverb sounds so good you'll probably find yourself soaking most of your tracks with it ! Go for it ! I mix on a real one of these all the time and this emulation is fantastic. I gave it 4 stars because the hardware unit is a bit darker, but to be honest, the emulation with an EQ sounds pretty much identical. It does that RX16 thing, so you should know what that is before you buy it. Good job on this one UA.. The emulation of the AD/DA audio path which is really important for me. Some people may find that not so important, but I love the noise characteristic of the orignal machine. The possibility to turn that feature on and off for those who don't want the sound of the AD/DA. Apart from that this is perfect, I love this reverb and couldn't live without it now. The interface is nostalgically not-so-intuitive and this plugin is a bit of a CPU hog but it's just so lush and full of character that the minuses are well outweighed by the pluses. This was the first "wow" processor I experienced as a young pianist in the studio in the 80s. I've owned an original unit with its noisy fan & background noise also. True it's not for everything, but for the dreamy verb factor it is a gem. Also the ambience algorithm is superb on drums. Having multiple reliable instances makes it better than owning the hardware. The emulation is superb & although the GUI may not be everyone's cup of tea it again reflects the original giving the same readout of genuine presets so suits me perfectly. Why four stars & not ten? Purely because it's a hungry beast on DSP but if that's the price of having modern Daw access to one of the most iconic reverbs I'm happy to pay it! Dense, beautiful, musical, clean, versatile, dozens of useful presets, stereo wide, natural! Different but as good as the L224, can not tell which is better. Just different. But it is my favorite now! Because I already had all the other UAD-reverbs in my account, I thought "oh well, just another verb, I already have enough". I thought wrong. The AMS Verb is in two words "instant character". Whether you want ultra-wide slapbacks or dark alley vintage-ness, it's all there. And it sounds extremely good. Together with the Lexicon-emulation, these two are my favorite reverbs to go to. One minor comment is the GUI. I understand that this is an identical remake of the original hardware-unit, but I'm using this plugin with my mouse, not with real buttons. Therefore, a more user-friendly GUI would be nice for guys like me, who rather use a slider with the mouse instead of clicking on nudge-buttons. I've been looking for a decent-sounding reverb plug-in for 10 years and have tried most of the popular plug-ins, but the AMS RMX 16 is the first a good-sounding and versatile reverb that I've heard. There seems to be a bug in one of the delay programs that puts a bit of unwanted reverb on the left channel, but aside from that, I'm very pleased with it. Simply put; if you can only have one reverb, this is the one to get. I have been wanting to own an AMS RMX16 for quite some time now, but the cost and fragility of these old units kept me away. So I was really hoping to get hold dog a plugin version and so when this was released I knew I had to own it. All of my favourite records have RMX16 all over them, so it was with great expectations that I fired up my first mix, replaced the reverb with the RMX16 and listened. Now I have never owned the real deal so can not comment on how close it is to the real unit, but what I can say is that the reverbs this plugin provides are excellent and sit in a mix extremely well. i couldnt believe in my ears when i firstly heard it and test the demo. it changed the sound of my mixes ! This is a very good plugin. It may sound silly to some, but what i miss is the noise part of the original hardware. i wish they would have modeled the AD/DA circuits, cause this part really sounds amazing. I also wish they would have include all the modes from the AMS, as in the update you can get from the company in LA who fixes those. (i think it is 6 additional mode). I compared some recording of the effects i have using the same modes and sometimes it doesn't really sound as huge (especially with reverse and non lin mode) but still I'm really happy UA and AMS-Neve did it. This has been one of my favorite reverbs since the 1980's. It was my "go to" unit in almost every mix I did that called for reverb. I did a lot of R&B mixes and I used it almost exclusively on ballads. I was waiting on UA to come out with this guy for quite some time now and I wasn't disappointed. It gives you that lush AMS sound and they really captured the factory presets. I have a lot of UA Plugins and I said that I wasn't going to buy one more until they brought this one out, and I picked it up the day it was released! Now I'd like to see a DBX-165, a Lexicon PCM-42, or an AMS Delay and I'll scoop those right up too!!! Long live AMS RMX16, long live Apollo 8 !!!!!! I have the original AMS RMX16 and the only difference is my old unit has an often unacceptable noise floor for ballads and quiet material. Its a spot on port over to the computer world. This plug in will change your mixes dramatically for the better, specially on drums. In the 80's when this was first released, it instantly became my first-choice reverb device. It was the original "Fairy Dust". The Ambiance programme became a classic reverb for it's musicality, character and overall richness. Increasingly, it's become harder to source a decent, fully-working hardware version from hire companies. With the arrival of this superb re-incarnation from the original coding of Mark Crabtree, life will have come full circle. The Apollo version is identical, and still has the identifiable character and life, without the noise. All the original features are lovingly re-created, all the pre-sets, including another classic, the Non-Lin. Go on, give your mixes some magic, it really is very special. I rarely review. But this reverb is just fantastic!! I had to say something. Everyone appears to be blown away by its use on drums, vocals and maybe some nostalgic effects. I've found that it can give a blissful, blurring glow on sustained strings with the non-linear program, and a Rhodes sounds just delicious with the Dark Plate preset. It truly does respond musically when you want it to. Personally I prefer not to hear the obviously electronic artefacts on a transient's tail, but on sustained material the glow it gives I just LOVE!